The Aleethia Foundation / Family Style Dinner! 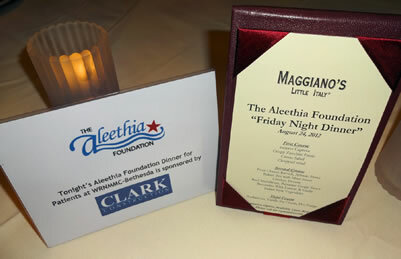 Aleethia's Friday Night Dinner on August 24, 2012 was hosted by Clark Construction Group and was held at Maggiano's Littly Italy. An Italian-American Tradition of dinner served “family style” was selected for the evening. Course after course after course provided a delicious array of authentic Italian dishes to choose from! No one left hungry! 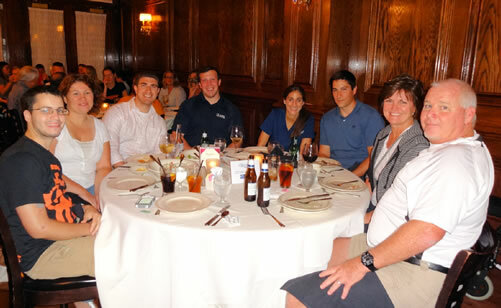 Several representatives from Clark Construction Group assisted with greeting and showing the way to the private rooms on the second floor of Maggiano's, served as table hosts and participated in the weekly door prize giveaway. 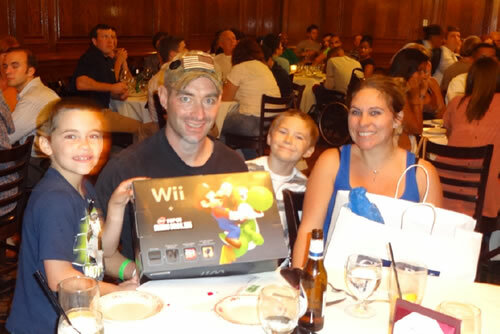 A family of five attending the “Friday Night Dinners” for the first time was delighted to be the lucky winners of a Wii – especially the children!!! Over 40 injured service members and 65 family members attended tonight's dinner. Thanks so much to Clark Construction Group for providing a wonderful evening for all!